Quite by accident, I stumbled upon a clock app written in Lua, a language which I had heard of (vaguely) but never read up on. I mean, really, does the world need YADSL? However, a closer look showed that Lua does not use almost-invisible curly brackets for structuring code and instead relies on those big, bold, evil kiddie-language END keywords. It is to rejoice. LUA for Windows is here; will report again when I fool with it a little. I’ve linked to this before, but it’s been a few years: Tom Swift Lives, home of some of the best fanfic I’ve ever seen, much of which is yards better than the original Tom Swift material. Over the past year, I’ve discovered that the most effective single pain reliever for my occasional migraines is…aspirin. I dropped Tylenol like a hot rock. Now there’s evidence that aspirin reduces the risk of cancer. Avoiding gastrointestinal bleeding is an issue, but I can’t imagine that that’s not just engineering. And here’s how the food industry’s quest to undercut butter and lard gave us trans fats, more heart disease, and the myth that animal fat is bad for you. I believe in evolution. We evolved eating animal fat. We did not evolve eating vegetable oils dissolved out of seeds with hexane. Q.E.D. I never gave this a thought, but it’s obvious if you think about it: Setting printed material in Japanese using movable type involved an immense amount of lead. Having killed Microsoft Reader, which I liked a great deal, MS is apparently investing in the future of the Nook. Will Reader return? Let us pray; I have a number of ebooks in that format. At least these Macbooks won’t be subject to trojans now. Or anything else. All the recent commotion over the agency model vs the wholesale model in ebook retailing reminded me of something: my very first pocket calculator. I got my first full-time job in September of 1974, and whereas fixing Xerox machines wasn’t riches, it paid me more than washing dishes at the local hospital. In short order I got my first credit card, my first new car, and a number of other things that had been waiting for my wallet to fatten up a little. One of these was a pocket calculator. The device itself has been gone for decades, but I’m pretty sure it was a TI SR-50, with an SRP of $149.95. I shopped around for the best price, since $150 was a lot of money back then. However, everybody who sold the SR-50 was selling it for $149.95. I bought it at a camera store downtown, and only a little research told me that it was covered under the Fair Trade laws, meaning that all retailers sold it for the same price, set by the manufacturer. I grumbled a little, but wow! I had a calculator! I gave it no further thought. Between 1931 and 1975, a significant chunk of retailing in the United States was basically on the agency model. Books, cameras, appliances, some foods, wine and liquors, and certain other things were sold for the price the manufacturer chose. This is one reason prices were often printed right on the goods. Retailer margins were open to discussion, but in a lot of industries, the margin was 40% or pretty close to it. The Fair Trade laws were enacted during the Depression to protect local one-off retailers from being driven out of business by much larger chain stores, during a time of reduced demand and thin profits. How well this worked is disputed, but by 1975 the laws had become so unpopular with the public and so difficult to enforce that they were repealed by an act of Congress. I grant that Fair Trade was not a clear win for the little guys. Some of my readings suggest that the Fair Trade laws accelerated the dominance of retail chains because chain retailers could build bigger stores and shelve a greater variety of goods, even if their prices were the same as prices in smaller, one-off stores. House brands were invented largely to evade the Fair Trade laws, since the retailer was considered the manufacturer for legal purposes and could set prices in stores as desired. This gave another advantage to large chains, since only large chains had the resources to establish house brands. Retailers compete on things like customer service and selection. Discounting allowed consumer prices to go down. Both the chains as a whole and individual chain retail stores got bigger. Smaller, independent stores vanished in droves. Small retailing became specialty retailing. This was certainly true of bookstores. Of the two bookstores I could easily reach on my bike in the 1960s, one became a card shop that carried a few books, and the other became a specialty bookstore carrying Christian/Catholic books only. Small retailers dealing in used goods hung on longer–think used bookstores and used record stores. The Doctrine of First Sale allowed used goods retailers to set their own prices even on Fair Trade goods. Manufacturer consolidation went into high gear. One reason, I think, was monopsony, which is the power big retailers have to dictate prices to suppliers. Smaller manufacturers who could not meet retailer price expectations merged with larger manufacturers, became importers, or went under. Retail prices will rise–though perhaps not as much as some fear. It will be easier to mount and maintain a new online retailer against competition by enormous retailers like Amazon. Given the above, with the consequence of more players in the retail market, monopsonistic pressures on cover prices will be greatly reduced. Absent Amazon’s monopsony, smaller publishers have a better chance of competing with much larger publishers, given small publishers’ advantages of lower fixed costs vs larger publishers. The presence of a larger number of smaller publishers will keep downward pressure on prices, since that’s their primary way to compete. Macmillan has to keep ebook prices up to protect its print hardcover line. Ten thousand small ebook publishers have no hardcover lines to protect. $10? No problem. $5? The new $10. Even within the agency model, small press will train consumers to expect ebooks to sell for $10 or less. There’s another consequence that I don’t think has any precedent in the Fair Trade phenomenon: Larger numbers of retailers and publishers will reduce the power of very large retailers or publishers to “silo” the business with proprietary file standards and DRM. There are problems with such an agency-based business model (and wildcards; Pottermore, anybody?) but overall I think those problems are more solvable than the collapse of book retailing into Amazon, Amazon, and more Amazon. So my vote goes with agency retailing. I’ve just told you why. (Polite) discussion always welcome. Not posting often here, but I’m ok. Working hard on several things, chief of which is getting my office and Carol’s exchanged, outfitted, and fully functional. This involves furniture, wiring, lighting, and sorting an immense quantity of glarble. I hope to return to regular in-depth posting soon. I have a new favorite cheese: cave-aged gruyere, which can be had sometimes at King Soopers, and is lucious with a good dry red wine. Get the oldest cheese you can find, as young gruyere tastes nothing like old gruyere. A year is as young as I buy. A book I’m not bullish on: Steven Johnson’s The Ghost Map, which describes how the cause of cholera (infected water) was proven by the persistent John Snow through charting of cholera deaths upon a map of London neighborhood water pumps. Why? The book does not include the actual ghost map named in the title. (So what else is missing or wrong?) Whatever editor let that past should be fired and spend the rest of his/her days stuffing toddler clothes in racks at Wal Mart. Could the TRS-80 Mod 100 possibly be 30 years old? Yes indeedy, and it was ubiquitous among tech journalists when I was at PC Tech Journal in ’85-86. Its keycaps made a distinctive sound, and sitting in a significant press conference back then was like sitting under a tin roof in a rainstorm. I yearned for one myself (the keyboard was wonderful for such a small device) but didn’t pull the trigger because the machine did so little other than keystroke capture. Toward the end of my tenure at Xerox I saw the Sunrise, which was a more ambitious take on the “lapslab” concept. My department was considering writing an app for it, so I had a loaner for awhile. Even better keyboard than the TRS 100, cassette data storage, modem…but the 3-line display was harder to read. Xerox private-labeled the hardware from another company, and basically killed it with a $1500 price point. (There was a flashier version that cost…$2500!) Xerox abandoned the market in 1984, after sinking what rumor held to be an obscene amount of money into it. One machine I did consider was the Exidy Sorcerer, which also had a good keyboard and didn’t cost $3000. Lack of software made me spend the $3000 anyway, on a huge honking S100 system running a 1 MHz 8080. One of the big issues between Amazon and the Big Six is an explosion of co-op fees, which according to some reports have increased by 30 times since 2011. The whole “co-op” business has always smelled gamey to me, but it had a purpose in the B&M bookselling world. How it fits into online ebook retailing is less clear, and in my view starts leaning perilously in the direction of bribery. I’m still watching the ASUS Tranformer Prime (their botch of its GPS support has kept me away for the time being) but the Prime has a little (as in cheaper) brother now, and it looks like a decent machine in its own right. Here’s Engadget’s detailed review of theTransformer Pad TF-300. Santorini is smouldering again. Yes, the volcano that may have made the Minoans extinct and launched the legend of Atlantis (or at least put an older legend on the map) is getting restless. Like the Greeks need that right now. Eating meat allowed our hominid ancestors to reproduce more quickly, by accelerating infant brain growth and thus shortening the breastfeeding period. (Breastfeeding naturally inhibits ovulation.) This on top of several other issues. Pete Albrecht sends a link to a map color-coding US gas prices by county. The very abrupt differences between states suggests that gas prices are more a question of state and local taxes than regional differences in demand. It was inevitable: A 3D printer that prints chocolate novelties. Now we need a 3D printer that prints spice-cake Easter lambs with ears that stay on. I’m behind on a great many things, especially fiction writing and replying to email, so bear with me until I get dug out from under the pile. Exchanging offices within a house is precisely the same as moving two offices, and that means a lot of boxes and a lot of bother, exploding intercoms being the least of it. I didn’t expect this wine to be as good as it actually is. About $11. The weather’s been beautiful here, so yesterday I was going to get out on the back deck with my Icom 736 and work the world. 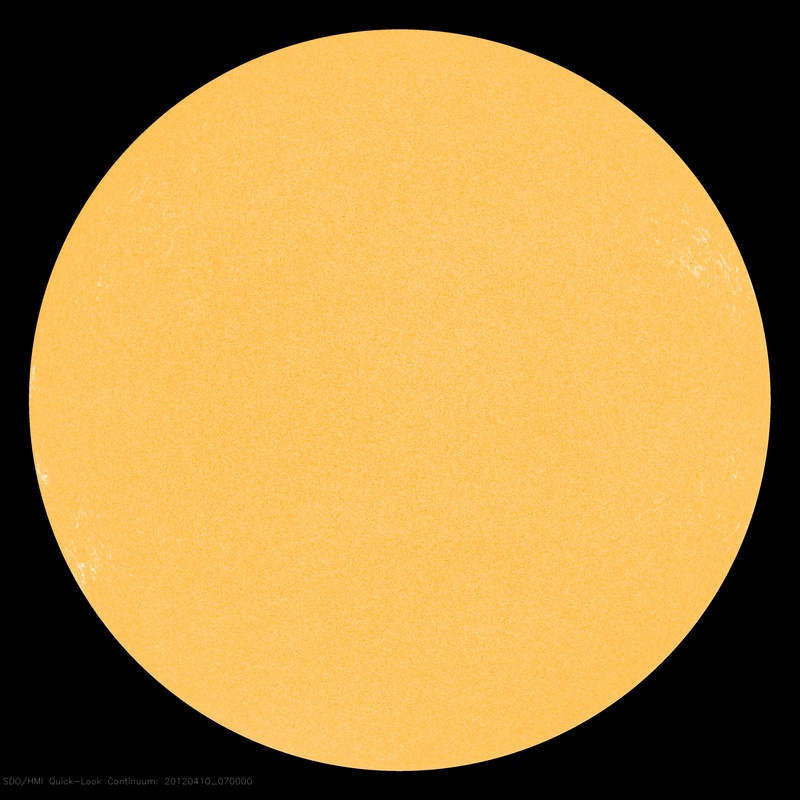 That was, of course, the day that sunspots basically vanished on the visible face of the Sun. What does it mean to have solar flares but no sunspots? Nobody knows. Thanks to many people (Jim Strickland being the first) who wrote to tell me about a “smart sand” project at MIT that is the first step toward the sort of nanoreplicator I postulated in my Drumlins stories: Tap in a 256-bit code, and some “smart dust” (very smart) in a stone bowl assembles something for you. I love it when my crazy dreams come true! From Michael Covington comes a link to a fascinating article about the other kind of abduction: abductive logic. If you’re a Sherlock Holmes fan, don’t miss it! The Colorado state law that led Amazon to nuke my Associates account has been declared unconstitional. No word from Amazon as to whether I can have my account back. I would probably buy one of these if I could find one in stock somewhere. Jack Tramiel has left us, having created quite a raft of famous computers, including the very best forgotten computer ever. I checked the date on this one, but it was nine days too late to assume it’s a hoax. One might argue that solar panels are more elegant, but you can’t make buffalo spaghetti sauce in a solar panel. I’ve seen more dumb YouTube posts than I’m willing to admit, but this one takes the cake for sheer willful stupidity. I knew how this worked in 1959, when I was 7. Kids, this is futurism. All we need now are better tacos. Carol and I are trading offices, and trading offices is a lot of work. I’m trying to do it right and not have piles of unsorted glarble on every horizontal surface, accruing new mass like black holes. That may be impossible; I don’t know. I’ve never had an office without piles of unsorted glarble. The nature of the glarble changes over the decades, but a quick trip through the photo albums confirms that the glarble has always been there. There’s another problem I intend to fix this time: Carol has always wanted an intercom between her office and mine. Lacking an intercom system we use our cellphones, but cellphones are not intercoms. I was born in the 1950s and I know an intercom when I see one: Intercoms have things that light up, ideally inside as well as on the front panel; and they buzz. The buzz is to remind you that their magical souls are yet alive within them. If they’re good intercoms, you can hear remote audio over the buzz. This is not something Carol yells very often, even across a 35-year marriage to yours truly. I got back to the kitchen pronto and found smoke curling out the holes in the masonite back panel and Carol cranking wide the kitchen windows. I suspected (as old-timers will agree) that a 50-year-old electrolytic had decided to go out kicking, as has happened to me more than once. Not so: Once I opened it up I found a relatively modern .05 tubular capacitor that had blown out one end and pewked up its foil-and-mylar guts in a spectacularly spiral fashion. I’ve never seen a cap die quite that way, and I can only assume that it had shorted internally. Its function in the circuit appears to be feeding low-level RF signal onto the power line from an RF coil. If shorted, the cap would bridge one side of the wall mains connection to the other side, through the secondary of the RF coil. (I may be wrong about this, but that’s how it looks through a magnifier.) Although the coil looks fine, the circuit isn’t working, and shorting wall current through a small coil of #30 wire is rarely good for the coil. Why am I so happy? Call me weird, but it’s like this: If it didn’t explode I wouldn’t have the fun of fixing it. So there. Carol and I traded offices here after completion of our downstairs rehab, and while the process is ongoing (much stuff is still lying around in boxes) I’ve come upon a problem I didn’t have before. Back in late March, I touched the metal bezel of a conventional USB 2.0 port on my desktop quadcore, and drew a 1/4″ spark. As you might expect, the machine died instantly. The new carpet generates a lot more static than the old carpeting did–and our customary 7-9% humidity doesn’t help. Why the USB port bezel wasn’t grounded is a mystery, since the wire coming out of the top panel encapsulated port assembly was screwed tight to the case, and the case to the third wire. I can only assume that something was broken inside the port assembly. I’ll tell you right now, I am not going to buy any Antec cases anymore. This is the second one that’s gone bad in precisely the same way: wonkiness in the front/top panel port assembly. Furthermore, I had to destroy the top panel to remove the port assembly, since the case metal completely blocked access to two of the plastic release tabs. No wonder they wouldn’t sell me a replacement port assembly, since the assembly could not be changed without destroying the case itself. Antec is off my list, now and forever. There’s nothing bleeding-edge in the new machine. The mobo is a Gigabyte Z68A-D3H-B3, if that means anything to you, with an Intel Core i5-2400 Sandy Bridge processor on it. The cores run at 3.1 GHz, vs 2.4 GHz for the old machine. I had them put it all in a Thermaltake V3 case, which is smaller and simpler than the Antec Nine Hundred I’ve been using since late 2008. I am not a gamer and am quite content with integrated graphics, so elaborate cooling machinery is unnecessary. The case fans are quiet (though one of them seems to rattle periodically) and overall I consider it a winner. The neon bulb experiment suggests that something more graceful than an old power supply could be put together as a grounding station. I have a wonderful 5″ bronze worm wheel given to me by Carol’s dad circa 1987, and with a little skill and some copper pipe fittings could build something with a VR-75 tube at the center, and the gear as the touchplate. Touch the plate, flash the tube, kill the static. I’m going to lash it up before putting a lot of work into it, but I see no reason why it wouldn’t work. More as it happens.